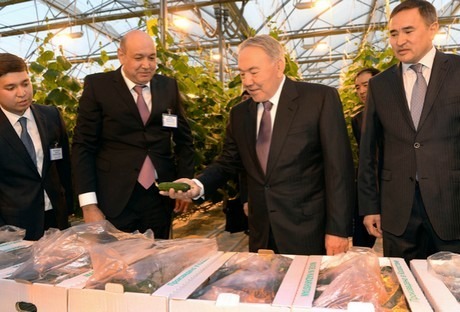 Over the past few years, the Kazachstan government from president Nursultan Nazarbayev has expressed its concerns and commitment to the development of local greenhouse production. As a result of this policy, the government has helped many Kazakh entrepreneurs, farmers and growers to establish their own operations, supported with the help of subsidies and finance via KazAgroFinance. As part of the campaign for the upcoming elections, president Nazarbayev paid a visit to the 11 hectare Adleya Greenhouse, one of the successful projects forthcoming from this Kazakh strategy. This shows that Kazakhstan will continue the support for the establishment of domestic greenhouse horticulture. The greenhouse of Adelya was built in 2013 by French greenhouse builder Richel Group. It has a state of the art 12.80 meter structure with a ridge height of 8.5 meters. The double vents are equipped with insect mesh and the entire structure is outfitted with double, insulated poly. The operations consist of 2 greenhouses of 5.5 hectares, one propagation greenhouse of 5000 square meters and a packing and facility warehouse of 5000 square meters. What makes the greenhouse company extra special is the fact that it has supplemental lighting installed in order to produce year round. As well as this the grower is using heating boilers, a heat storage tank and a CO2 dosing system.